The Queens Museum invites aspiring artists aged 7–11 to participate in our unique two-week summer camp. The Big Time Summer Art Thing for Kids is part creative laboratory, part arts gym carefully designed to help campers explore the meaning of art, while engaging in fun and innovative art-making activities. Campers will have various opportunities to explore and discover new and exciting forms of creative expression. Art mediums covered will include, puppet making and performance, painting, drawing, bookmaking, weaving, sculpting, collage, printmaking, and ink painting. 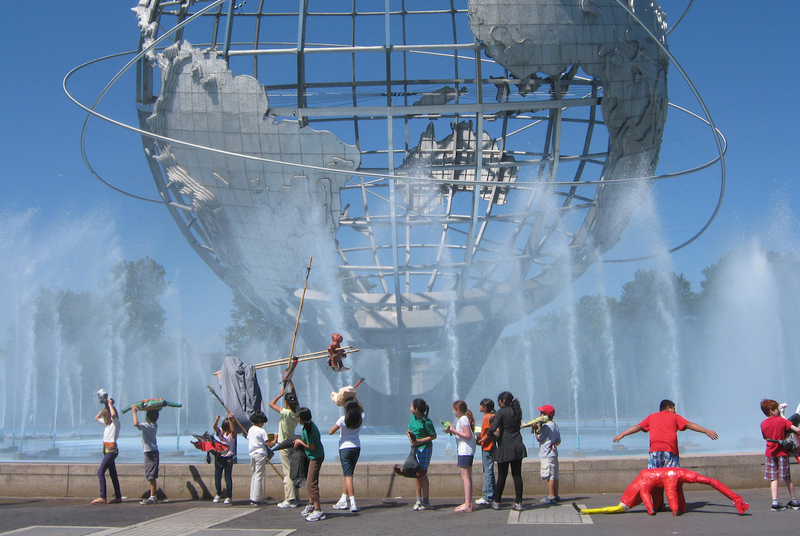 When they are not in the Queens Museum’s galleries, studios, or Flushing Meadows Corona Park, students will enjoy time outdoors including taking trips to the Queens Zoo and the Queens Botanical Garden. The Queens Museum Big Time Summer Art Thing for Kids Team is led by two Queens Museum teaching artists, accompanied by a staff of gifted youth assistants from the Museum’s Queens Teens program and supported by a manager. The Museum offers four different programs between July and August. Programs are for children aged 7–11 only. Feel free to register your child for one or more programs if you like. Each program runs Monday through Friday 9am–4:30pm. Lunch and drinks are not provided, however, we supply snacks!